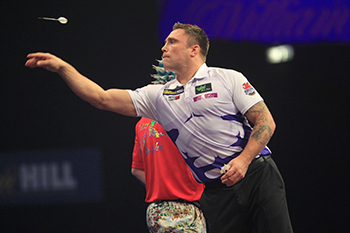 GERWYN PRICE has quickly established himself as one of the world’s top Darts players since turning professional in 2014. The former Rugby player progressed through PDC Qualifying School at the first time of asking and claimed some impressive scalps in his debut season. In 2015 Price become a household name, thanks largely to his brilliant run to the quarter-finals of the World Matchplay – one of the sport’s most prestigious tournaments. A year later, the Welshman proved his winning pedigree by claiming his first PDC ProTour title – a feat he repeated in the very next event. 2017 saw Price reach the top 16 in the PDC Order of Merit and his impressive progress has seen him earn spots at World Series of Darts events, where the sport’s elite players compete to showcase the game around the globe. Price captained Wales in the 2017 World Cup of Darts, which saw him reach his second televised final, having been runner-up in the UK Open earlier that year. His explosive on-stage demeanour and unquestionable natural talent has seen him earn place in the Premier League in 2018.